For those without comedic tastes, the "questionable parody" of this website called Wikipedia have an article about Finis Jennings Dake. 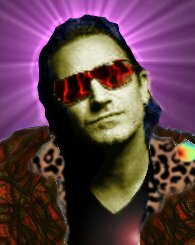 Finis is the original incarnation of Bono, lead singer with popular beat combo U2 (pronounced Yoo Squared). Born primarily out of wedlock, he was forced to live disguised as an antelope for his first 7 years. It was this fact that explained his stunning inability to climb trees. Finis lives on in the memories of the St Hilda bingo hall choir members. This page was last edited on 22 June 2011, at 16:02.